I am behind on my blog but I have a lot more of the illustrations for the children’s book, “For I Am Yours”, completed. 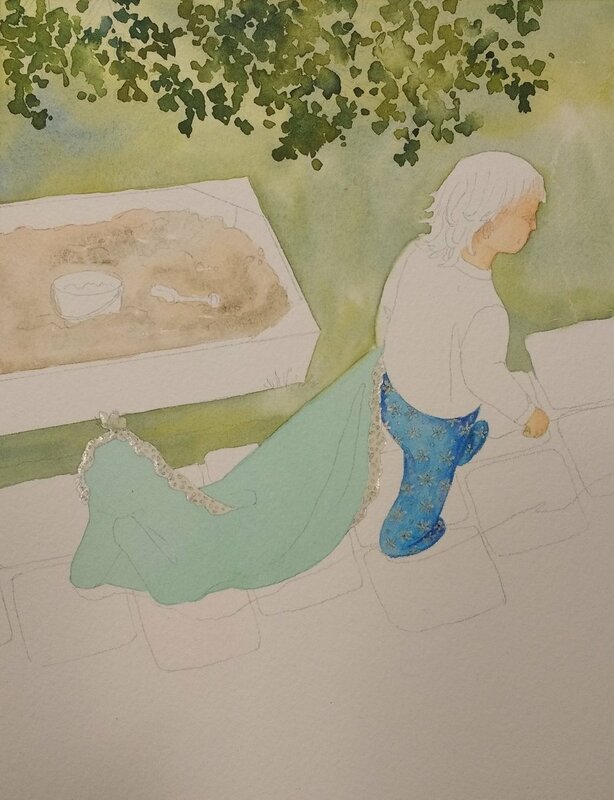 For those that are new to my blog, I am creating 17 watercolor illustrations for a children’s book written by author, Pauline Hawkins. Some of these 17 illustrations are 9”x7” and some are the double spread and therefore, 9”x14”. The story is told from the blanket’s point of view and, as the baby grows, the blanket is needed less and less. The blanket is a metaphor for a mother’s love. 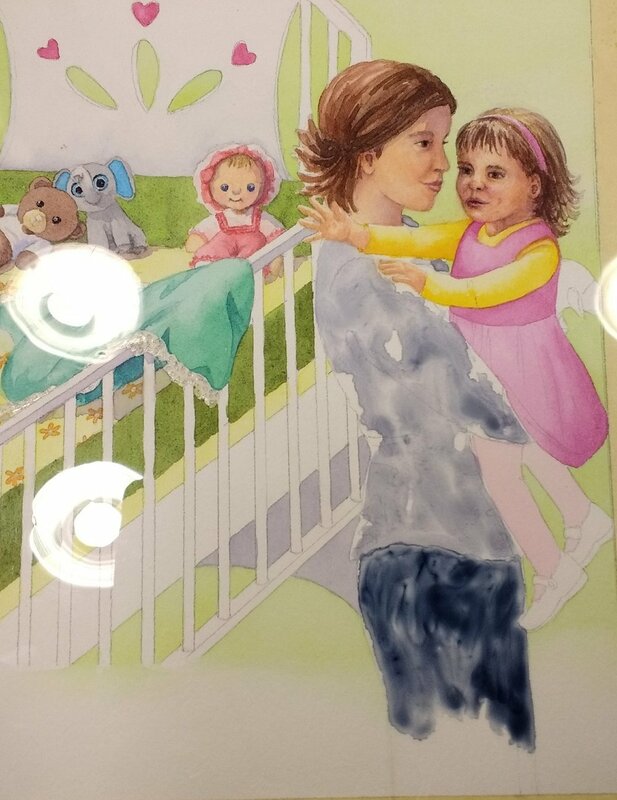 One of my favorite images so far is early on in the story when Blankie meets Baby for the first time and feels her breath on it’s ruffles. I enjoyed the close up view of the baby and tried to create a peaceful color scheme. 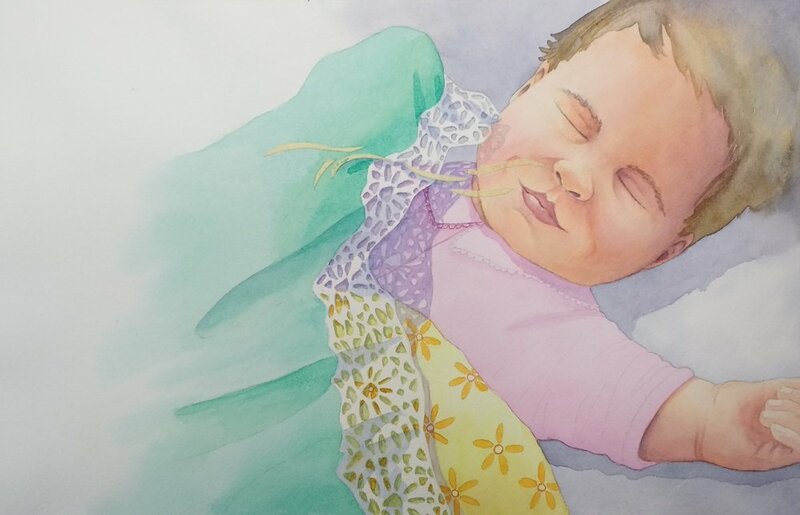 I started this watercolor with thin washes of color on the blanket, the babies skin, and the clothing. Then I started building the depth with glazes of the same colors. I use a warm red (Pyrrol Scarlet) with New Gamboge Yellow for the base skin tone on the baby and then start to glaze on more of the same colors for depth. I also use other mixes to cool the skin tone down in places or give it shadow. Some of the mixes I like are: Quinacridone Rose by itself or with a yellow like New Gamboge or Aureolin Yellow, Permanent Alizeran Crimson & Ultramarine blue for the shadows and Pyrrol Scarlet with a tough of Burnt Sienna for warm, darker areas. I also leave some glazes with hard edges and use water to soften other edges after applying them. If there were more dramatic light on the baby, my glazes would be darker and might have harder edges in places. Before starting the painting, I used some masking tape on the shapes that would become the baby’s breath. The tape was applied over my pencil line and then cut out. You can see more of this process in my blog post at this link: Masking a Watercolor With Masking Tape. You can see the masking tape in this image because of the darker paint. In this image I have continued to work around the painting. I applied the first layer of color to the hair and used some water toward the upper right corner to soften the hair into that corner. I also used some Indigo while the paint of the hair was still wet to darken the corner. I have started to add shadows. These additions allow me to see how all of the values and colors are working without over committing too soon. So, I take my time and keep building until I feel I have an area completed. I was not working from a photo for this image, as is the case for most of the illustrations in this children’s book. Therefore, I am using my knowledge of other paintings to create the light and form of the objects. I purposely kept the light on the babies face a little softer and used harder shadows on the blanket and the fabrics to keep the look of the baby soft and sweet. Whenever, I work on a face, I tend to make adjustments and changes as I go. With watercolor this can be a little tricky. I was happy with this painting, but in one of the later figures, I ended up having to start again because I could not get the facial features to work. To finish this illustration, I removed the masking tape from the shapes representing the babies breath. I then used a small flat brush with a little water to soften some of the edges of the white shapes, so that they would not stand out as much and look more “atmospheric”. If you would like to see more of these illustrations, please follow along and I will continue to blog about this journey. 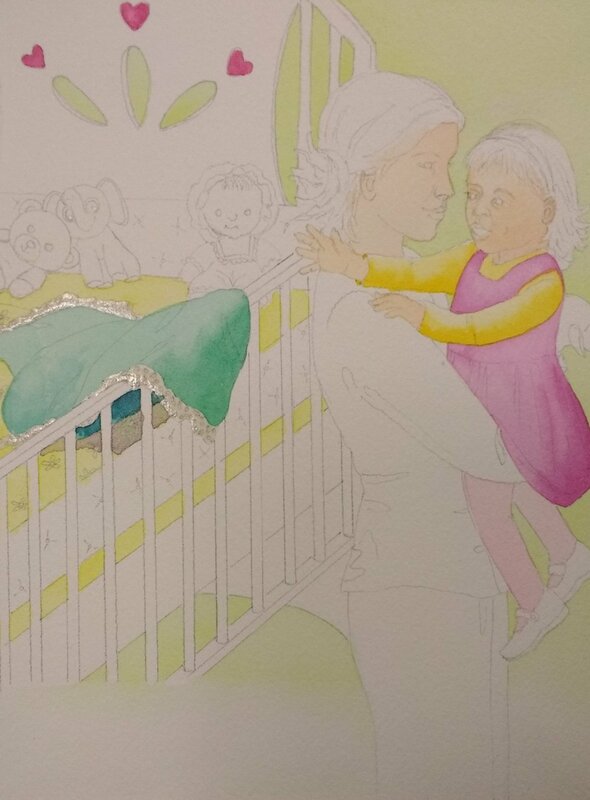 This is the continuation of my posts to create 17 watercolor illustrations for the children’s book, “For I Am Yours” by Pauline Hawkins. My plan was to post about the process every Friday, but life got in the way! I have until the end of July to complete all 17 illustrations, so I have planned to get one or more done each week. Right now, I am ahead, but some of the coming illustrations will have more figures in them and I am anticipating these to take longer. The images that I have completed are not in order. I have skipped around to the ones that I felt either wouldn’t take too long or that I felt the drawing was resolved and ready to go. The first two pages also helped me figure out the colors for almost everything because they will be repeated throughout the pages. Here are the first two pages with the blanket waiting for the baby to arrive. Before applying paint, I masked some of the shapes with Winsor and Newton masking fluid. The shiny shapes in photo #1 is the masked areas. The masking will protect the white paper until I am ready to paint in those areas or I can leave them white. Then I started painting the background walls. I used a mix of Aureolin (Cobalt) Yellow with Amazonite Genuine (a turquoise blue) and created a soft yellow green. Because I am making up these scenes, I am building them slowly so that I don’t go too dark. I found it easiest to paint in the objects that I was certain of their color and value and then move on to the objects with more value or color variations. As I add objects, I keep adjusting the things around the room because I can better judge the value of everything. I ended up needing to increase the value of the walls and I gave them some shadows in the corners to make them less important and bring the focus to the middle of the image. In the final image, I have everything painted in and I have added shadows. .
As I was working on these pages, I took a break in the beginning and started adding some color to the second double page spread. It helped to get away from the first image to see it with fresh eyes and while one area dried on the first image, I often added the glazes to the second image. Again, I started by painting in the color on the bedroom walls and the color on the blanket. In this scene the blanket has a little more character and is dreaming of the day the baby comes home. I used some Winsor Newton and some Pebeo (blue) masking fluid to save some of the smaller parts of this illustration. I then started painting the image of the baby in the ‘dream bubble’. I used a mix of a warm red (Pyrrol Scarlet) and yellow (New Gamboge), thinned with water to paint the base color on the skin and slowly added layers of color to form the face of the infant. I used lighter color and soft edges along the outside of the bubble to make it feel like a dream. After looking at the scene some more, I decided to increase the size of the circles that lead to the thought bubble. Using some masking tape over the area, I cut out the larger shapes. I used a small piece of a ‘Mr. Clean Magic Eraser’ to scrub off the color and get those areas back to the white of the paper. If you use a ‘Mr. Clean’ make sure to use the kind that does not have soaps or chemicals because you don’t want to transfer these to the watercolor paper. Also, test your paper. The ‘Mr. Clean’ is abrasive and can tear some papers. The final image here still has some areas that need adjusting or painting. I also decided to add the lamp in the lower right corner. I was able to use the same method listed above with the tape and ‘Mr. Clean’ to lift the paint and get back to the white surface of the paper. I was pleased with the outcome of the first two, double page spreads, for the children’s book. I have already started work on several others and will continue to post more as I create them. Thanks for following along! Yesterday, I started painting two of the pages on Fabriano 140 lb. hot press paper. I have used this paper for other paintings and really like it for ink and watercolor. However, while painting one of the figures in the story, I tried to make a change by lifting some color off with a stiff brush and because the Fabriano is a soft paper, the paper surface became marred. My usual substrate, Arches watercolor paper, can handle a lot of rougher techniques like: lifting, masking, and scrubbing. So, I decided instead of struggling with the Fabriano throughout this process, I would go back to the Arches paper. After deciding to change back to Arches 140 lb. cold press paper, I began with pages 3 and 4 because there are no figures, accept toys, on this double spread. So, I could get used to my process for the illustrations without the extra pressure of painting a figure. My paper was stretched and dried overnight. I taped the edges down to help hold the paper a little more firmly while painting some of the wetter areas. Then I masked some of the shapes with masking fluid to protect them while painting. Before starting the painting, I mixed a large amount of the color for the wall color in the baby’s room and a smaller amount for the blanket. I mixed the colors in some jars with lids to hopefully have enough to use for all the pages of the book. I used a mix of Amazonite Genuine by Daniel Smith (the aqua color) and Aureolin Yellow for both colors. There is more yellow the wall color and more Amazonite in the blanket color. I began painting the bedroom walls on dry paper because I didn’t want to lighten the color I had premixed. This is a different way to work because I usually mix the color I need as I am working on a painting. Once the wall color was dry, I started painting some of the other objects in the room. I am making up the scenes, so I have to imagine where the light is coming from and how that will affect the objects. I will be adding layers and making adjustments as I go. I have 3 other pages drawn and stretched onto the Arches watercolor paper. I will start painting portions of these that repeat from this first image like: the blanket, walls, stuffed animals, etc. That way I can get a production line going. I have one video on my Youtube channel so far and will continue to film and post others. And you can check out Pauline Hawkins’ blog post - “For I Am Yours: The Story Behind the Story”.